This entry was posted on February 1, 2010 at 1:09 am and is filed under 1980's hair metal albums, 1980's hair metal bands, 1980's heavy metal albums, 1980's heavy metal ballads, 1980's heavy metal hits, 1980's heavy metal bands, 1980's heavy metal guitarists, 1980's heavy metal music, 1980's heavy metal songs, 1980's metal music, 1989 heavy metal music, Album Review, cool album covers, hard rock bands, hard rock music, heavy metal album covers, heavy metal album review, heavy metal albums, heavy metal albums 1989, heavy metal bands, heavy metal history, heavy metal legends, heavy metal music, heavy metal music 1989, heavy metal videos, heavy metal vocalists, metal music, metal odyssey, Music, old school heavy metal, old school heavy metal bands, rock music with tags 1980's hair metal albums, 1980's heavy metal albums, 1980's heavy metal ballads, 1980's heavy metal bands, 1980's heavy metal music, 1980's heavy metal vocalists, Album Review, anytime power ballad, anytime song 1989, anytime video and song, bodo schopf drummer, current heavy metal guitarists, guitar legends, hard rock music, heavy metal album review, heavy metal guitarists, heavy metal music, mcauley schenker group, mcauley schenker group 1989, metal odyssey, michael schenker guitarist, Music, old school heavy metal, robin mcauley vocalist, rock music, rocky newton bass guitarist, save yourself album 1989, steve mann guitarist. You can follow any responses to this entry through the RSS 2.0 feed. You can leave a response, or trackback from your own site. Thanks for the Metal compliment… it’s appreciated. Once I caught onto MSG it seemed I never looked back. Graham Bonnet was on lead vocals for ’82’s “Assault Attack”… man, the song “Dancer” on this album always stuck with me. Honestly, when it comes to MSG, I really can’t point out a dud for an album or even close to a dud. I used to have “Assault Attack” and ’83’s “Built To Destroy”, (with Gary Barden), on vinyl… not to sound like a broken record here – I wish I never got rid of ’em. 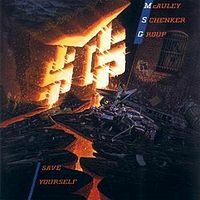 My “MSG” vinyl, from 1981, was where it all began for me… then I bought the the debut “Michael Schenker Group” album from 1980 and on it went. I always kept my “MSG” vinyl, it’s become sentimental to me and I could never see it leaving my collection. I’ve been listening to stuff from them on YouTube for a while. I like it and want their first three albums. Too bad the imports are so expensive. You may come across them used… on Amazon. It’s amazing how some of “the really great albums” are imports and cost more, I used to think this type of madness would stop years ago… I was wrong. My domestic version of “Save Yourself” is out of print… your right, the import price is laughable.